Reading and share top 193 famous quotes and sayings about Being Beautiful by famous authors and people. Browse top 193 famous quotes and sayings about Being Beautiful by most favorite authors. 2. "Leif's frown eased and he slid his finger under my chin and gently caressed my jaw line with the pad of his thumb. "Pagan,will you do me the honor of being my date for Homecoming Dance?The prospect of not being able to hold you in my arms all night is heartbreaking. "Mirand sighed from across the table. "Okay,that was beautiful.Why didn't you ask me like that? "she asked Wyatt.Wyatt shot Leif an annoyed frown. "Thanks,buddy.Next time you decide to break out your romantic side,could you do it alone?" 3. "Many couples, many people, are not living with real human beings, but with their ghosts. 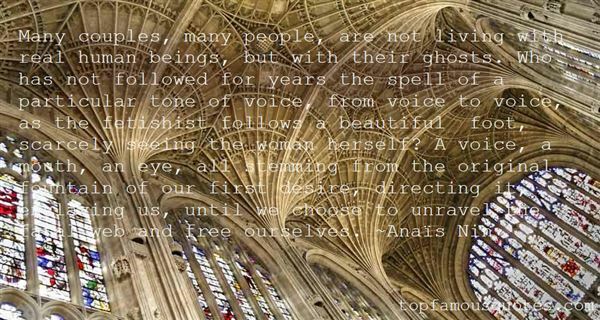 Who has not followed for years the spell of a particular tone of voice, from voice to voice, as the fetishist follows a beautiful foot, scarcely seeing the woman herself? A voice, a mouth, an eye, all stemming from the original fountain of our first desire, directing it, enslaving us, until we choose to unravel the fatal web and free ourselves." 4. "I am aware of being in a beautiful prison, from which I can only escape by writing." 5. "My feeling about growing up in New Jersey was, 'How come I'm not in New York?' That being said, I'm older and I have a better worldview now, and so I think I grew up in an incredibly privileged position. The town I grew up in is beautiful. I got a great education, and I'm very grateful for it." 6. "One or a couple of good thoughts may be a fluke or derived from life's challenges, a few can be a practice or a lesson from failures and bad experiences but the consistency of excellent quotes is certainly a mark of an excellence that being prepared, harnessed , nurtured and nourished in the beautiful soul of a very big heart only." 7. "Drawing is the art of being able to leave an accurate record of the experience of what one isn't, of what one doesn't know. A great drawer is either confirming beautifully what is commonplaceor probing authoritatively the unknown. ::: Brett Whiteley :::"
8. "I thought: this is how you make a human being. A human being is beautiful and sick. A human being glitters and starves." 9. "For Schwartz this formed the paradox at the heart of baseball, or football, or any other sport. You loved it because you considered it an art: an apparently pointless affair, undertaken by people with special aptitude, which sidestepped attempts to paraphrase its value yet somehow seemed to communicate something true or even crucial about The Human Condition. The Human Condition being, basically, that we're alive and have access to beauty, can even erratically create it, but will someday be dead and will not.Baseball was an art, but to excel at it you had to become a machine. It didn't matter how beautifully you performed SOMETIMES, what you did on your best day, how many spectacular plays you made. 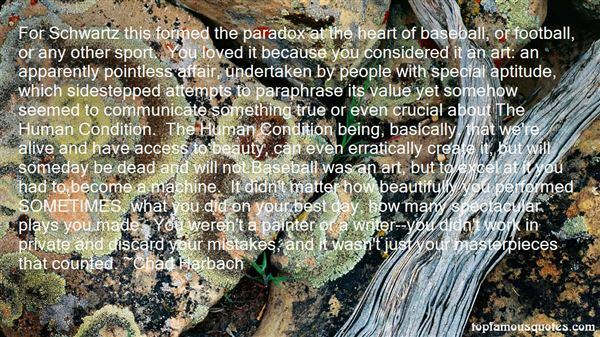 You weren't a painter or a writer--you didn't work in private and discard your mistakes, and it wasn't just your masterpieces that counted." 10. "It is at despair at not being able to be noble and beautiful by natural means that we have made up our faces so strangely." 11. "Her heart--is given him, with all its love and truth. She would joyfully die with him, or better than that, die for him. She knows he has failings, but she thinks they have grown up through his being like one cast away, for the want of something to trust in, and care for, and think well of. And she says, that lady rich and beautiful that I can never come near, 'Only put me in that empty place, only try how little I mind myself, only prove what a world of things I will do and bear for you, and I hope that you might even come to be so much better than you are, through me who am so much worse, and hardly worth the thinking of beside you." 12. 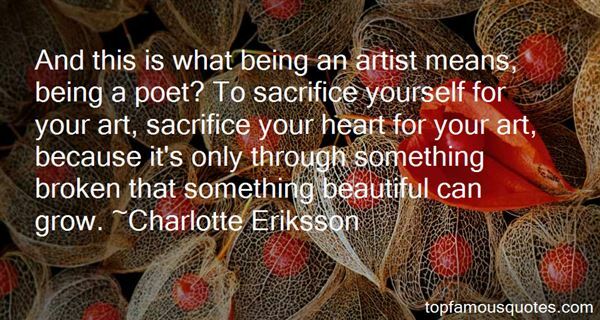 "And this is what being an artist means, being a poet? To sacrifice yourself for your art, sacrifice your heart for your art, because it's only through something broken that something beautiful can grow." 13. "Some may see the tortured existence of the musician as one where he's practicing like hell and being alone, I see it quite differently. Having three children, beautiful as it is, burdens you with terrible things often, with strong decision and sleepless nights. Tis is real life. And then, of course - this is getting into very personal things- I see many ­­­­­­parts of me that are what would be called the "dark side". I had a happy childhood, but what was happening to my family, my parents, and also the dark tings that happpened-between them and where they come from, the war- there is a lot that i could not put in easy words. But it's what most of us carry. It's just whether you have the ability to voice it in the music, whether you allow yourself to be touched by thing , to be receptive to other people, to be in the pain of a composer." 14. "We don't know how much we are capable of loving until the people we love are being taken away, until a beautiful story is ending." 16. "I always look at a pretty face this way though: it's only half an inch away from being homely. And me, I'm only half an inch away from being beautiful. If I had half an inch less of nose and half an inch more of chin, I'd be a regular bald-headed beauty queen." 17. "Now, in Mr. Thornton's face the straight brows fell over the clear deep-set earnest eyes, which, without being unpleasantly sharp, seemed intent enough to penetrate into the very heart and core of what he was looking at. The lines in the face were few but firm, as if they were carved in marble, and lay principally about the lips, which were slightly compressed over a set of teeth so faultless and beautiful as to give the effect of sudden sunlight when the rare bright smile, coming in an instant and shining out of the eyes, changed the whole look from the severe and resolved expression of a man ready to do and dare everything, to the keen honest enjoyment of the moment, which is seldom shown so fearlessly and instantaneously except by children"
18. "If I were to live in Africa, serving the poor, the number-one thing I'd miss wouldn't be running water or electricity - it would be style... being able to get dressed up and feel beautiful." 19. "No matter how correct a mathematical theorem may appear to be, one ought never to be satisfied that there was not something imperfect about it until it also gives the impression of being beautiful." 20. "I think I related more literally to the early 'Spider-Man' comics from Steve Ditko because it could be upfront and direct about the problems of being a kid. He captured being a teenager so beautifully." 21. "If these Mount Everests of the financial world are going to labor and bring forth still more pictures with people being blown to bits with bazookas and automatic assault rifles with no gory detail left unexploited, if they are going to encourage anxious, ambitious actors, directors, writers and producers to continue their assault on the English language by reducing the vocabularies of their characters to half a dozen words, with one colorful but overused Anglo-Saxon verb and one unbeautiful Anglo-Saxon noun covering just about every situation, then I would like to suggest that they stop and think about this: making millions is not the whole ball game, fellows. Pride of workmanship is worth more. Artistry is worth more." 22. "That Hegelian dialectics should provide a wonderful instrument for always being right, because they permit the interpretations of all defeats as the beginning of victory, is obvious. One of the most beautiful examples of this kind of sophistry occurred after 1933 when the German Communists for nearly two years refused to recognize that Hitler's victory had been a defeat for the German Communist Party." 23. "In a world of fog and gray, the youth is a shining being dressed in dark violet, his golden-flecked hair smoothed back from his bronzed temples. He resembles a human, but no man I have ever seen holds himself like a king, like a gleaming statue chiseled from topaz.I swallow. I am standing before a demon, the most beautiful being I have ever seen, and I can't run. I can only stand in the hushed glade and stare, snowflakes falling in the space between us." 24. "I have no fear of being less beautiful, I've always been afraid of not being beautiful." 25. "Madame Tallien shared honors with Josephine Beauharnais in being mistress to Barras, an ex-nobleman and ex-terrorist whose appetite for beautiful women, beautiful young men, and money was the only wholesome trait in his character." 26. "Fate does not invite ugly boring people to save the world; and if you do try to save the world (without being beautiful, strong, clever, or wise), you will soon die pointlessly and how much adventure is there in that?" 27. "I am essentially optimistic. Being alive is incredible. Life is extraordinary and beautiful. It can be hard and sad and terrifying, but it's all we've got." 28. "I didn't tell her about the free-for-alls on the school yard, muggings on the bus. A girl burned a cigarette hole in the back of another girl's shirt at nutrition right in front of me looking at me as if daring me to stop her. I saw a boy being threatened with a knife on the hallway outside my spanish class. Girls talked about their abortions in gym class. Claire didn't need to know about that. I wanted the world to be beautiful for her. I wanted things to work out. I always had a great day no matter what." 29. "Falsity cannot keep an idea from being beautiful; there are certain errors of such ingenuity that one could regret their not ranking among the achievements of the human mind." 30. "On being conscious of being a writer: As soon as one is aware of being "somebody," to be watched and listened to with extra interest, input ceases, and the performer goes blind and deaf in his overanimation. [...] Most of the best fiction is written out of early impressions, taken in before the writer became conscious of himself as a writer. The best seeing is done by the hunted and the hunter, the vulnerable and the hungry; the "successful" writer acquires a film over his eyes. His eyes get fat. Self-importance is a thickened, occluding form of self-consciousness. The binge, the fling, the trip – all attempt to shake the film and get back under the dinning-room table, with a child's beautifully clear eyes." 31. "This was middle school, the age of miracles, the time when kids shot up three inches over the summer, when breasts bloomed from nothing, when voices dipped and dove. Our first flaws were emerging, but they were being corrected. Blurry vision could be fixed invisibly with the magic of the contact lens. Crooked teeth were pulled straight with braces. Spotty skin could be chemically cleared. Some girls were turning beautiful. A few boys were growing tall." 32. "I walked down Paseo del Prado, losing myself to the sights, sounds, and dense magic of the city. There's something weirdly calming about being alone in a big city. It made me feel like the universe was hugely generous, and that my species was so damn smart to have constructed such a beautiful city." 33. "Being a celebrity is probably the closest to being a beautiful woman as you can get." 34. "I love bookshelves, and stacks of books, spines, typography, and the feel of pages between my fingertips. I love bookmarks, and old bindings, and stars in margins next to beautiful passages. I love exuberant underlinings that recall to me a swoon of language-love from a long-ago reading, something I hoped to remember. I love book plates, and inscriptions in gifts from loved ones, I love author signatures, and I love books sitting around reminding me of them, being present in my life, being. I love books. Not just for what they contain. I love them as objects too, as ever-present reminders of what they contain, and because they are beautiful. They are one of my favorite things in life, really at the tiptop of the list, easily my favorite inanimate things in existence, and ... I am just not cottoning on to this idea of making them ... not exist anymore. Making them cease to take up space in the world, in my life? No, please do not take away the physical reality of my books." 35. "Although beauty may be in the eye of the beholder, the feeling of being beautiful exists solely in the mind of the beheld." 36. "This proves the significance of individualism; being able to face the music, to embrace it, and then create something beautiful from it. You can't truly be happy unless you're unhappy sometimes and the pinnacle of life can only be reached when one can carve their own path." 37. "The moment you become miserly you are closed to the basic phenomenon of life: expansion, sharing. The moment you start clinging to things, you have missed the target--you have missed. Because things are not the target, you, your innermost being, is the target--not a beautiful house, but a beautiful you; not much money, but a rich you; not many things, but an open being, available to millions of things." 38. "His name was Paul Eluard, and he said this thing once: There is another world, but it is in this one...It's like, you know, inside every stove there's a fire. Well, inside every grass blade there's a grass blade, that's just like burning up with being a grass blade. And inside every tree, there's a tree, and inside every person there's a person, and inside this world that seems so boring and ordinary, if you look hard enough, there's a totally magical beautiful world. And anything you would want to know, or anything you would want to happen, all the answers are right there where you are right now. In your life." 39. "The main reason I became a teacher is that I like being the first one to introduce kids to words and music and people and numbers and concepts and idea that they have never heard about or thought about before. I like being the first one to tell them about Long John Silver and negative numbers and Beethoven and alliteration and "Oh, What a Beautiful Morning" and similes and right angles and Ebenezer Scrooge. . . Just think about what you know today. You read. You write. You work with numbers. You solve problems. We take all these things for granted. But of course you haven't always read. You haven't always known how to write. You weren't born knowing how to subtract 199 from 600. Someone showed you. There was a moment when you moved from not knowing to knowing, from not understanding to understanding. That's why I became a teacher." 40. "With him being so charming, and so perfect, so heart-achingly beautiful, but tarnished in all of the right places, and in all of the ways that I understood so well, how could I not love him?" 41. "Perhaps all dragons in our lives are really princesses just waiting to see us just once being beautiful and courageous." 42. "Newsflash she already has body image issues. It's an intrinsic part of being a woman. Every woman in the world has some part of herself that she absolutely hates. Her hands are too small, her feet are too big, her hair is too straight, too curly, her ears stick out, her bums too flat, her nose is too big and, you know, nothing you can say will change how we feel. What men don't understand is, the right clothes, the right shoes, the right makeup it just... It, it hides the flaws we think we have. They make us look beautiful to ourselves. That's what makes us look beautiful to others.Used to be all she needed to feel beautiful was a pink tutu and a plastic tiara.And we spend our whole lives trying to feel that way again." 43. "I am learning everyday to see the silver lining on every dark cloud. To see the life lesson in every situation; to feel joy and peace in every circumstance; to hear and speak only positive, uplifting, kind and caring words; to touch hearts in a positive and meaningful way; to be inspired by others and to be inspirational for others. To truly make a significant difference in my life and the lives of others by becoming my best self and being the best I can be in service to them. I still have a long way to go, but I feel life becoming more enriched as I keep climbing upwards and moving forward in my quest to create a more Loving, Peaceful, Joyous and Beautiful world." 44. "If only, then, I had been more living out of the present--such a beautiful word...present. The sense of it being, now to me, more beautiful than 'to look forward." 45. "A plain sock by itself is terribly boring, but it could score points by having a clever stitch pattern, or maybe by being made out of a very beautiful yarn that's an enchantment to work with. (Sadly, it is still infuriatingly true that being beautiful without being clever is almost worth more points than being clever without being beautiful, but such are the rules of life and knitting-they are cruel, but there anyway)." 46. "It an extraordinary tin to meet someone you can bury your soul too, who accept you for what you are. I'av been waiting for a very long time to get beyond what I am with ''Bella'' I feel I can finally being. So I ill make a totz to my beautiful berried no measure of time with you will be to long effort with for ever." 47. "Nanny Ogg was an attractive lady, which is not the same as being beautiful. She fascinated Casanunda. She was an incredibly comfortable person to be around, partly because she had a mind so broad it could accommodate three football fields and a bowling alley." 48. "Don't let pain & heartaches and looking for better solutions in life...STOP you from being happy! Enjoy loving life and every beautiful sunset it has to offer!" 49. "We all dream of being exactly what we are – powerful, beautiful, and worthy." My eyes darted between them, and even thoygh I was brimming with questions, it's like I had so many I had no idea where to begin. All I knew for sure was that I was going back.Back to the earth plane.The glorious earth plane!"